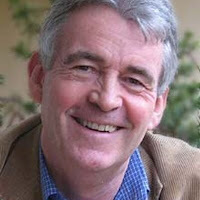 Simon Mawer was born in 1948 in England. Like many children whose fathers were in the RAF, he spent a nomadic childhood in England, Cyprus and Malta. Educated first at Millfield boarding school in Somerset, it was here that he learnt the importance of being able ‘…to preserve a secret, interior world.’ All good qualities for a potential writer. When people ask him where he comes from, he says he is still ‘…unable to reply. I have lived in Italy for more than three decades, but Italy is not home. Home is where the mind is, perhaps.’ He went on to study zoology at Oxford University, Brasenose College, before becoming a teacher of biology. Mawer is the prolific author of ten novels and two non fiction books, his bibliography is still growing. The Glass Room, published by Little, Brown in January 2009, was on the Man Booker shortlist. His current novel is entitled Tightrope which won the 2016 WALTER SCOTT PRIZE for historical fiction. 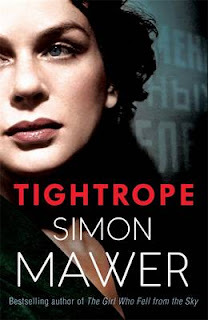 Tightrope is the postwar story of Marian Sutro, protagonist of The Girl Who Fell From The Sky. You can read the first chapter of Tightrope here. Mawer published his first novel, Chimera, (Hamish Hamilton, 1989) at the comparatively late age of thirty-nine. It won the McKitterick Prize for first novels. He has lived in Italy since 1977, where he taught Biology at a British International School before becoming a full time writer in 2010. In 1990, Mawer was awarded the McKitterick Prize for Chimera. In 2003, the Boardman Tasker Prize for Mountain Literature, The Fall; which also made the Man Booker Prize, longlist. 2009 saw The Glass Room shortlisted for the Man Booker Prize, and the Walter Scott Prize, shortlist, in 2010. Journey? Or aimless rambling? I guess it began when I started telling stories – usually of dubious taste – to my fellow inmates in prep school. This was in the late 1950s. Later, when I made my ambitions public, my parents pointed out that you need a day job if you want to write. Pretty good advice really. So I drifted towards university with vague ideas of becoming a doctor (Chekhov? Somerset Maugham? ), but afterwards drifted into biology teaching to give me nice long holidays for writing. Marriage and family slowed things up a bit and it wasn’t until I was in my late 30s that I was brave enough to subject a completed novel to the baleful gaze of agents. Rather to my surprise the book (Chimera) was taken on and sold on first submission (to Hamish Hamilton). Despite that book disappearing without trace, the aimless rambling had taken on some kind of direction. One or two books later my biology (I love biology) came into the mix with Mendel’s Dwarf and my first US publication. That was when people began, just began, to take a bit of notice. I don’t see myself as having a role as a writer – it’s just something I do. And I often wonder what I enjoy about it – it’s not easy and it does take inordinate amounts of time. But I do get immense pleasure from hearing from people who have themselves enjoyed my writing. The money comes in useful too. I empathise with all major characters – you can’t write convincingly if you don’t – and I’ve fallen in love with more than one. Marian Sutro in particular. But who’s fooling whom? Characters are creations in words and the only real test is whether the reader can picture them – whether, for a few minutes, the writer can suspend the reader’s disbelief. And if one or two characters come across as a bit dodgy, even despicable – perhaps Lanik in The Glass Room – well, you love your children, warts and all. I’ve never thought of writing anywhere other than home. That happens to have been Italy for the last 38 years, more by accident than planning. I don’t look out on a Tuscan olive grove with the sea in the distance and cicadas buzzing in the pine trees; I look out on other houses and the window is closed and the air conditioning is on because it is unbearably hot in summer. It could be anywhere else. As long as it’s home. Don’t. Become a dentist or an accountant. They’re always in work. But if you must attempt a novel, then understand that the answer does not lie in creative writing courses, it lies in imagination and a way with words and a rigorous ability to criticise your own work. The business of a novelist is sculpting with words. Words are fickle, evanescent things and it is never easy to organise them properly. You must work away at them over and over again. Write and rewrite. Read them out loud and listen to them. You’ve got to develop an ear for words. That’s the key to writing – it’s not what you meant, it’s what you have actually written. All that exists are the words on the page. Insecurity seems to be the abiding characteristic of most novelists. Yes, I’m writing something at the moment, but will it be my next novel? I’ve no idea. With experience one gains the ability to write convincing passages but a novel is more than a collection of such passages strung together. It needs shape and structure. Has it got that? Not yet. Will it ever have? I don’t know. This monthly meeting will help with planning your novel, developing plot, characterisation, dialogue, point of view, first chapter, as well as giving you feedback on your writing. Allen Ashley has been published in dozens of books and magazines in the UK, USA, Canada and Spain and has now passed his first century of short story publications. Allen is a highly respected author equally adept at novels, short stories, poetry and lyrics. He is also well known for a wealth of critical commentary and non-fiction articles and, more recently, as an acclaimed and award winning editor. As well as being a writer and editor, Allen has run writing workshops and panels in the London boroughs of Enfield, Newham and Tower Hamlets as well as at the conventions Alt. Fiction in Derby and the BFS Fantasy Con (in Walsall and Nottingham). He runs a number of workshops in North London. For the last few years I’ve enjoyed the privilege of reviewing books for The Bookbag, an online treasure trove featuring works of fiction and non-fiction as well author interviews and competitions. I have been a voracious reader all my life. On one level, my love for stories is about escapism, but I also enjoy studying how and why they work – or don’t! – and I am always keen to learn more about the creative process behind fiction of all kinds. I was delighted when I got through the Bookbag’s application process but I was also nervous about the task ahead. Never having written a novel, I worried that any criticisms I made might seem invalid. However, the first book I had was a real gem - Erin Kelly’s The Poison Tree, her debut novel, and oddly enough that made me understand my task a little better. The sheer volume of books on the market means that most new books have only a tiny voice in the promotional world. Reviewing provides the opportunity to go fairly deep into the reasons why I have enjoyed a book so much and I hope that speaks to potential readers. All reviews on the Bookbag are spoiler free, but I try to address issues including style and structure so that readers of my reviews will get a sense of whether or not a book is a good choice for them. The first time I had to review a book I didn’t enjoy, I thought about it really carefully because I thought it was important to keep in mind that some people would enjoy it and just because I hadn’t, that wasn’t a reason to deem it “bad”. I felt the main thing was to review the book the author had actually written. That may seem blindingly obvious, but I am sometimes surprised at statements made by critics and reviewers. The point of critically appraising the work that has been put in front of you is to do just that; telling the potential reading audience that the book would have been better placed in the 18th century than the 19th century, or that the hero should have been male and not female, seems to me to be missing the point. I also feel it is fair to comment if I find the writing style confusing or clunky. Another problem that crops up sometimes is that of ramping up suspense so high that whatever happens cannot really meet expectations. It’s a fine balance; the ramping up itself is a key storytelling skill as it keeps the reader engaged, but if what follows is a let-down, then the story as a whole cannot be said to have worked. I also comment if I feel that characters have been under developed and if anything has been over-described. Overall I try to give a fair sense of the book and always highlight good points as well as problems. I am also honest about my favourite types of fiction and state if it the book I am reviewing is the type I am naturally drawn to. I want readers to glean fair and balanced information from my reviews, so I feel it’s important to include those notes. That said, reviewing has expanded my range of reading. For example, left to myself, I might have not have read Stephen Grosz’s The Examined Life: How We Lose and Find Ourselves or Matthew Kneale’s An Atheist’s History of Belief. However, reviewing books has also made me conscious of keeping up with non-fiction in order to keep relating to fiction. Both those books are beautifully written and gave me a window into subjects I might not have explored otherwise. Reviewing books has also given me the chance to help promote books that didn’t get as much fanfare as I expected. Examples include Eliza Graham’s The History Room , and Alison Love’s The Girl at the Paradise Ballroom. These both feature fascinating stories at their very core, compelling and relatable characters and sophisticated writing. Now that I’ve been reviewing for a while, I am also seeing authors progress in their careers. A recent example is Martine Bailey. Her first book, An Appetite for Violets, was a really enjoyable read, but her second book, The Penny Heart, was even better; a triumph of tactical storytelling. I do still choose to read some books purely for pleasure - but my adventures in reviewing – despite being a little nerve wracking at times! – have enhanced my appreciation of all kinds of writing as well as increasing my book collection. I’ve also enjoyed meeting some of the authors in person as well as chatting with them on social media. This has provided me with further insight into the novels, enhancing the experience even more. If you are looking for a way to expand your enjoyment of books, I can definitely recommend reviewing! Hayley Webster was born in 1977 and lived for most of her childhood in Thatcham, Berkshire. After achieving a first class BA in Literature from Essex University, Hayley trained as a teacher and taught for a while before working as a journalist for a magazine. 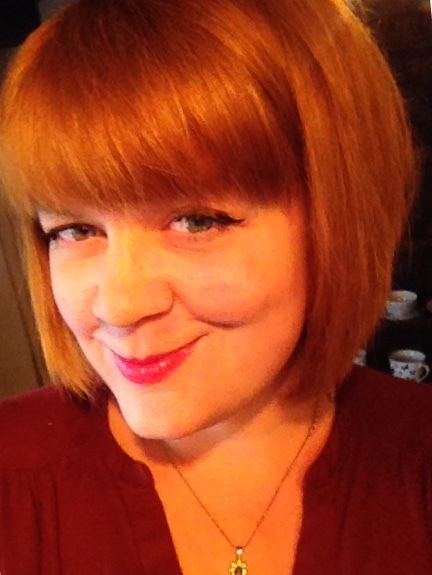 A passionate reader and enthusiastic writer Hayley studied for an MA in Creative Writing at the University of East Anglia where she received a distinction. Shortly after she won the Escalator Award for Literature which gave her the opportunity to develop her first novel, Jar Baby, published in 2012. 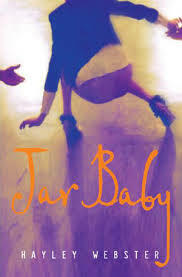 Jar Baby: Diana Rickwood’s formative years, living with her famous fashion designer Uncle Rohan, were far from glamourous. Banished into the background, forbidden to interact with the models, Diana lives a lonely life. When at 19, her uncle is engaged to Stella Avery, Diana goes to London to escape the memories of abuse perpetrated by Stella’s chauffeur. For the next ten years she breaks all contact to forget her past. The darker side of fairy tales where abuse, violence and fear are common themes, are used effectively to convey Diana’s lonely and troubled existence. However upon Uncle Rohan’s death Diana is forced to revisit the past and, as supressed memories surface, she uncovers secrets and lies which mask a shameful family past. Through the characters of Jar Baby, Hayley captures, in her unique style, the darker side of human nature. She also injects humour and a lighter tone which contrasts well with the more disturbing aspects of the novel. Thank you Hayley for the following wonderful answers and good luck with your future writing. I like that question because I find it interesting looking back to the start, to work out how and why it began, to find the threads of all the stories and the words. The bare facts of the journey are that I did a degree in Literature, I did an MA in Creative writing, and Jar Baby, my first book was published in 2012. But they feel like drawing pins in a much more detailed map of somewhere I’m still discovering all the time. My mum started teaching me to read when I was two and half and so stories were always there. I was so lucky when I started school as they let me read books from the library when the others were learning to read. I can’t separate my journey as a writer from my journey as a reader, they are definitely plaited together. I read most of the classics between the age of around 8 – 13, I just worked my way through these ones my parents had, they were faux green leather with ‘gold’ trim. They were for display but I decided to read them. I thought them magical, like something from The Magician’s Nephew. I told myself they gave me magic powers but what they really did was give me the urge to create a narrative. But also the urge to smash a traditional narrative into pieces and make something new. I first wrote something independent from adult supervision when I was about 8. It was a story I made into a book with pages and illustrations called The Girl with the Golden Hair, about a girl who’s reflection was far more beautiful than her and it would climb out at night and get up to things she’d get blamed for in the morning. I wrote a lot of my own versions of Alan Bennett’s monologues during my GCSEs, one for coursework, but I kept writing them. I couldn’t leave the form alone. I got 100% for a story I wrote at ‘A’ Level called The Bride, a sort of gothic horror story with a lot of quiet menace, a man being lured from his wife by dark music and odd happenings, and things moving in paintings. My teacher said it was a feminist treatise in story form. I was pretty pleased with that. I guess the journey has been finding ways to write voices that I feel nobody’s heard. And my ultimate aim is to write something original with a page-turning feel because of plot, but with the language and beauty of poetry. That’s always what I’m striving for, whether I’ll ever get there or not is a different matter. I guess the first answer is to tell stories. My role is to tell stories in new ways. To make people think. I’m not interested in the traditional narratives we are told again and again. I see my role to tell stories that are new, but have always been there, and haven’t had the chance to be heard. To entertain too. You have to be lost in a book. I don’t think I’ll ever write a comforting book, although I have books I read for comfort in my reading life (Charlotte’s Web being the main one). What I like the most about being a writer is that I’m doing the thing I’ve always wanted to do, that I’ve always had a compulsion to do, and that there are people reading what I write and making new links in their heads between my words and their own experiences. It’s like being a magician. I think I’ve always done a lot of that. I believe strongly in the idea of everyone seeing him or herself as the hero of their own story, even the ‘villains’. In what I’m writing at the moment there is a female character who’s very judgemental towards other women, quite cold and takes pleasure in seeing others fail, but during the book you understand why, and hopefully grow to care for her and want her life to change. I keep being drawn to the idea of whether there is anybody who doesn’t deserve empathy, and who gets to decide who is and isn’t. Where does the morality come from? How do we decide who is a hero and who is a villain? I’m certainly interested in those heroes who turn out to be villains and vice versa. I wrote a character in Jar Baby, Trudy, who I really liked. I set her up as a kind of perfect mother figure, the sort I’d like, and then I played about with how that ideal might make us not notice when someone like that hasn’t got our best intentions at heart. Trusting the wrong people is a recurrent theme in my writing. In the past I would have answered this question with something like Iceland, or somewhere where there are lakes, and lots of sky. A log cabin. A cottage in the woods… but recently I’ve realised that the best place to write is where I am, wherever that is. There is never the perfect time or place to write. The main thing I need in order to write is to have a computer and some paper. I need internet connection to look things up quickly. Or a reference library. I need tea. Or coffee. And toast. And that’s about it. I am happy to write wherever I find myself. I have recently realised I don’t like writing in silence or at a desk, or by a window. I’m a sitting-on-my-bed-with-notes-spread-about-me-like-wrapping-paper-at-Christmas kind of writer, I think. That said, if someone wants to lend me a flat in the centre of Paris, my answer is an immediate, ‘YES’. This is such a hard question. Oh. Oh. I wish I’d written Possession by A.S. Byatt because really there is no other book like it and it is a masterpiece, bristling with knowledge and ideas and beauty and made up poetry and some bits of story that slice you in the guts. It’s not just an intellectual novel – although I love it for that – it’s brilliant on how history is written, whose stories we listen to, and how if something is not written down by an official source who’s to know it happened. I cried at the end. Proper sobbed. If not that then Until I Find You by John Irving. Because I read that book and it was like having your body turned inside out. All the detail. And all the pain at trying to find the truth about yourself. And all the characters so detailed and real, and yet those dual seams of humour and utter despair. They are the two writers I read and think I shouldn’t bother anymore. They make me want to be better. I’m not sure how anyone writes without reading. I’d say read twice as much as you write but that’s just a personal thing. So. Write. That's it. There's never a perfect time. 85,000 awful words are better than 10 wonderful ones. I wrote a few novels that I never sent to anyone or even considered publishing. Just write. And find readers you can trust to be honest with you and a community of writers if that helps. I used to go a lot onto www.abctales.com ten years ago and I found it invaluable and have kept many of the friendships I made there, including having a few as first readers of my work. Oh, and ignore the goal of publication being the be all and end all. You want what you publish to be good. Just write. And celebrate redrafting. It’s so important. There is no rush. It’s a cliché but it’s the truth. If you’re waiting for the perfect time or a good idea for a story it will never happen. I’m working on a book narrated by three (or more actually) women. The starting point was why are we so interested in stories of bad men’s redemption when each bad man leaves a list of invisible women in his wake? Mostly, though, it’s a mystery and about the redemptive powers of women’s friendship. And shows how easy it is to be manipulated when you have no power of your own, and asks if it’s ever possible to get that power back? There’s a lot of dark in it, but there’s humour too. One of the narrators is a 40 year old woman who grew up in care, another is an 80 year old Doctor’s wife who’s spent her life being defined by her marriage, and the other is a fifteen year old girl during the days of the Baedker Raids in Norwich in 1942. Most of the novel is set on one street. I’ve always wanted to write a book set on one of those Norwich streets packed tight with terraced houses and hidden history, where everybody breathes each other’s memories. 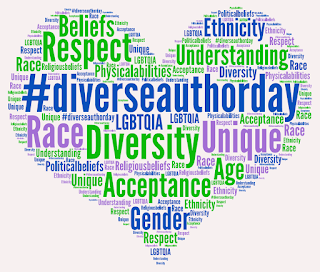 Some of us hope to contribute to the conversation and celebrate with writers, authors and very important - readers, to join in and tweet about diverse characters in children's, YA and adult fiction novels from any period in publishing history. The concept of diversity encompasses acceptance and respect. It means understanding that each individual is unique, and recognizing our individual differences. 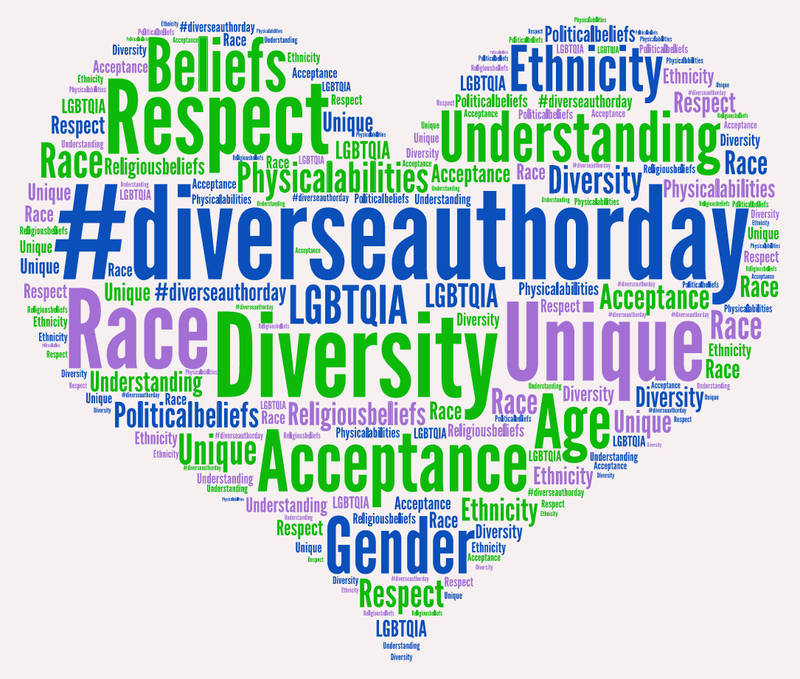 The books and characters we will be publicising will be along the dimensions of race, ethnicity, gender, sexual orientation, socio-economic status, age, physical abilities, religious beliefs, political beliefs, or other ideologies. JOIN US and celebrate our differences. We want to move beyond simple tolerance to embracing and celebrating the rich dimensions of diversity contained within each book.